Low immersion dyeing is the technique I use for dyeing my fabrics. 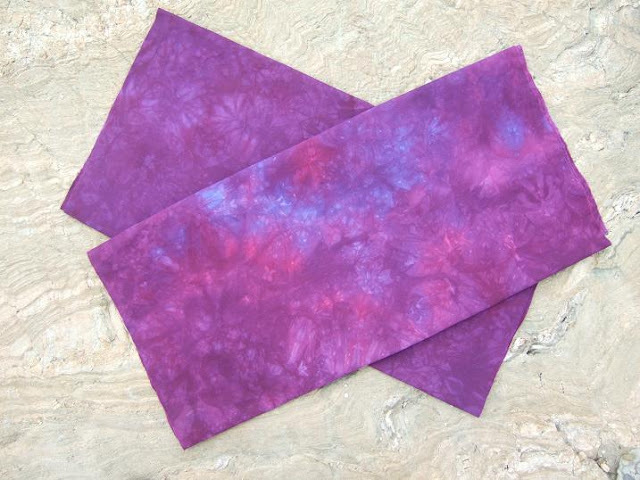 Last year a local artist was kind enough to teach her dyeing method to Lori, myself and a few other quilters. After her introducing this method to us, Lori and I experimented with different techniques and came up with a method that works for us. 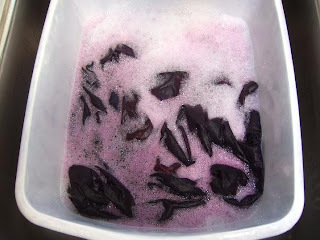 So I am not saying this is the only way to do low immersion dye, just our way and I thought I would share some of what we have learnt over the past year of our dyeing journey. Supplies. To be honest it is a bit of an investment at first to get all the supplies needed but well worth it if you plan on doing a lot of your own dyeing. I purchase my Procion MX dyes from G&S Dyes in Canada. They also carry the Sodium Carbonate (as known as Soda Ash), Raycafix and TNA soap that is also needed. You will also need salt and in the beginning I was told to use non-iodized salt but I now use regular salt as it makes no difference. 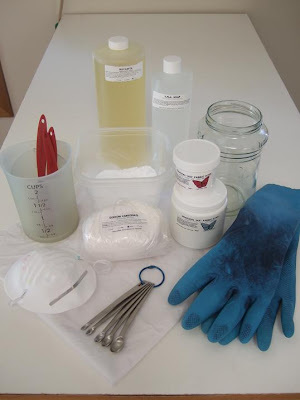 You will also need measuring cups, measuring spoons, containers for dyeing, rubber gloves and a mask. Fabric. 100% cotton fabric but be careful as some cottons dye better than others. Our first batch of fabric that we purchase did not take the dye well and we ended up with white patches. Then we discovered Wazoodle and buy our white cotton from them. It takes the dyes beautifully. I have also experimented with white on white prints. 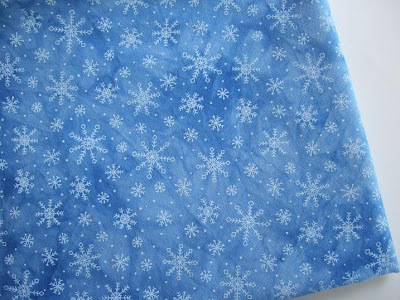 The print resists the dye and stays white while the background takes the dye like in this snowflake fabric that I dye with Royal Blue. Safety Always were gloves and a mask when working with Procion MX dyes! ALWAYS! Procedure I will go step by step to show you how we dye a 1/2m piece of fabric to get one color with some texture using two powdered dyes. 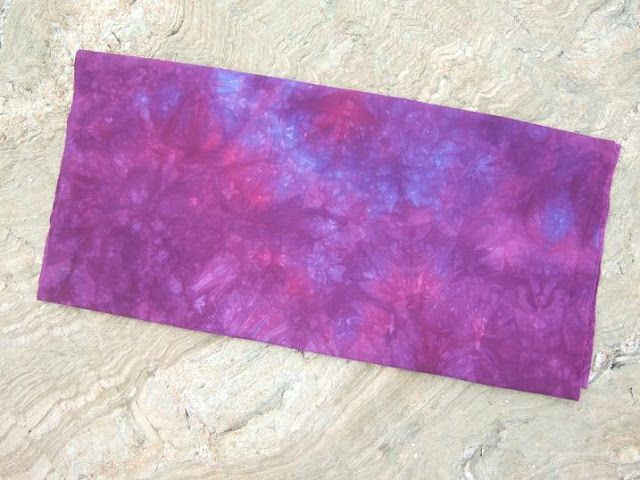 For this sample I used Hot Pink and Cerulean Blue to make purple. Step 1. Pre wash your fabric with TNA ( Synthrapol) soap to remove all the sizing and residues on the fabric. Step 2. Cut a 1/2m piece of pre-washed fabric, width of fabric. Step 3. Crumple the fabric into a jar, I used a glass Cheez Whiz jar. I like to crumple but if you want to play with folding techniques to get different patterns that works well too. Step 4. In a 2 cup measuring cup mixed 3/4 tsp of Hot Pink and 3/4 tsp of Cerulean Blue together and then slowly pour in 1 1/2 Cups of hot water while stirring. 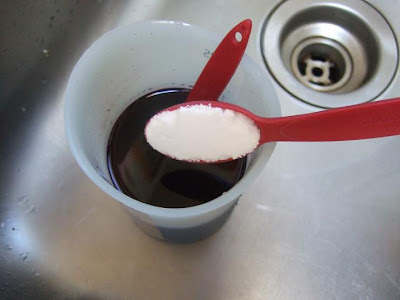 Add 2 tsp of non-iodized salt into the mixture and stir until all the dye and salt is dissolved. 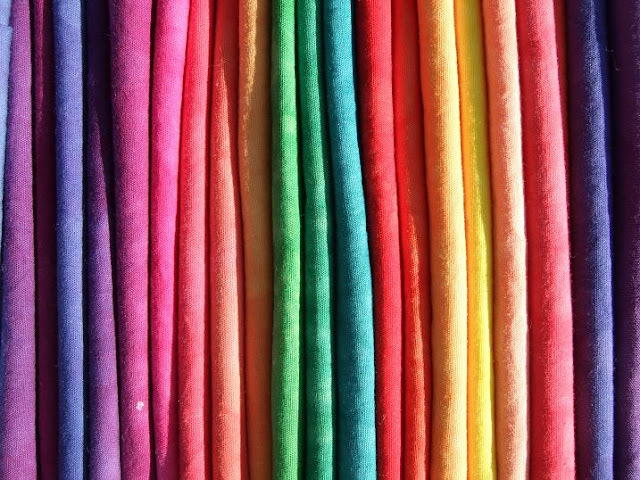 Some dyes need more stirring than others. The salt is used to brighten the colours, we have tried salt and no salt experiments and the fabric with the salt always turned out much brighter. The general rule for salt quantities is 1 tsp of salt for every 1 cup of water used. Step 5. 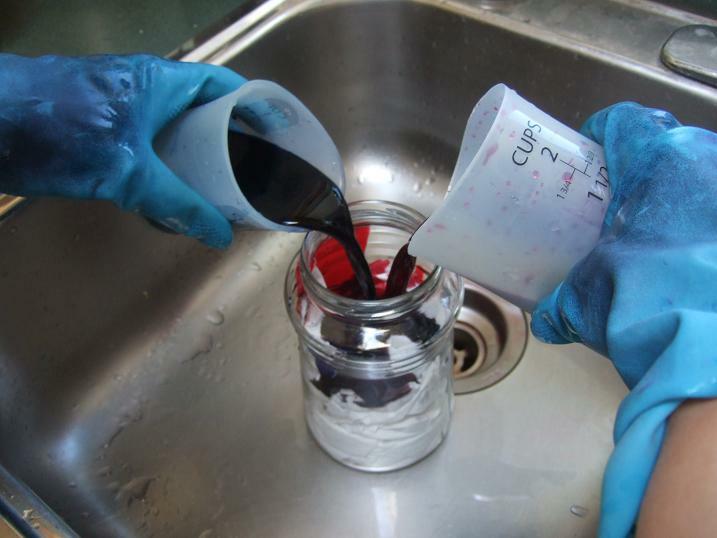 Pour dye mixture over the fabric in the jar. I like to poke and stir it a bit with a stick to make sure all the dye gets to all the fabric. The more you stir the less texture there will be. Step 6. Mix 2 tsp of Soda Ash (Sodium Carbonate) in 1/2 Cup of hot water. Stir until dissolved. We usually wait about 20 minutes from the time the dye is poured onto the fabric to the time we pour in the Soda Ash over the fabric. 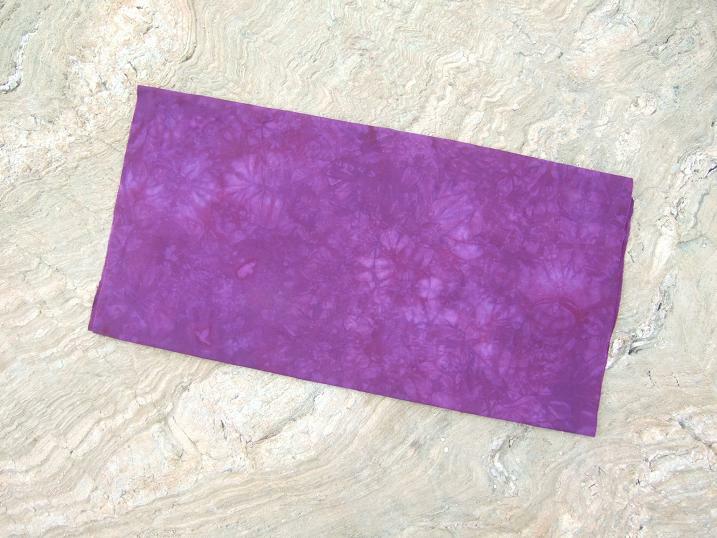 Soda Ash is a fixative and we like to let the fabric have time to absorb the dye before pouring on the fixative if you want a more even texture with your fabric. The general rule for Soda Ash quantities is 1 tsp for every 1 cup of water used. We used 1 1/2 cups of water with our dye mixture and 1/2 cup water with our soda ash mixture for a total of 2 cups of water. 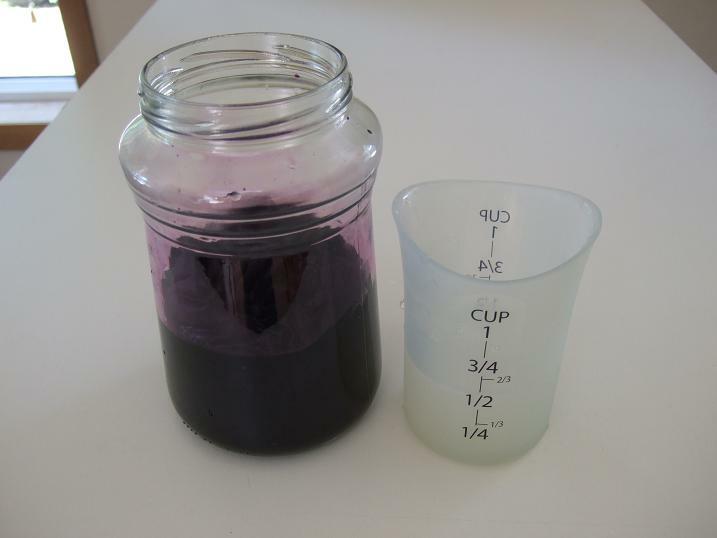 Our water quantities are based on the amount of fabric your dyeing so in general we use 2 cups of water for .5m fabric, 4 cups water for 1m fabric, and so on. Fabric in 1 1/2 cups of dye water ready for 1/2 cup of Soda Ash mixture to be poured over top. Step 7. Let the fabric sit in the dye/soda ash mixture for at least one hour. If you want a solid colour fabric then after a few minutes take the fabric out of the dye jar, gently squeeze out most of the dye and then place it in a ziploc baggy for an hour. Step 8. Pour out dye water. Fill a tub with warm water with 1/2 tsp of TNA soap or Blue Dawn dish soap (works just as well) and place fabric in water. 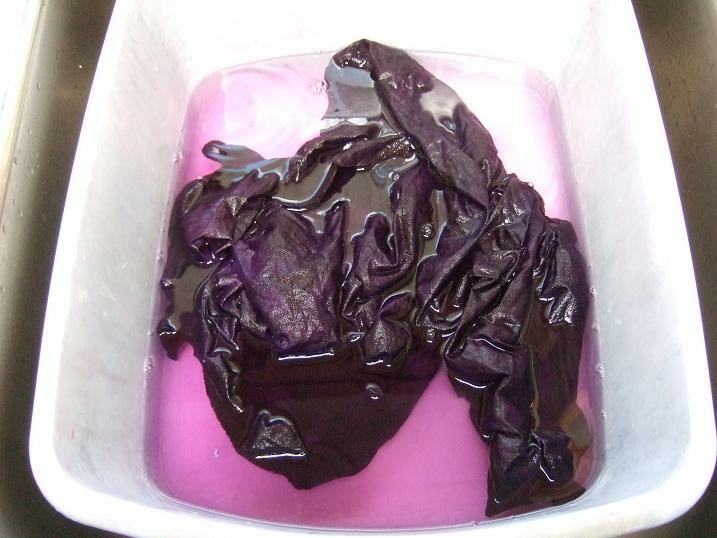 Agitate fabric in water to wash off excess dye. Step 9. Squeeze out fabric and then place in a tub full of hot water with 1/2 tsp Raycafix ( Retayne). Raycafix is a fixing agent that will prevent the fabric from bleeding. Let the fabric sit in the Raycafix for 5 minutes without touching it. Squeeze out fabric and rinse under clean water. If colour still runs soak in Raycafix again. Pinks seem to need more Raycafix to set. Step 10. Put fabric in washing machine on rinse cycle and then dry in dryer. 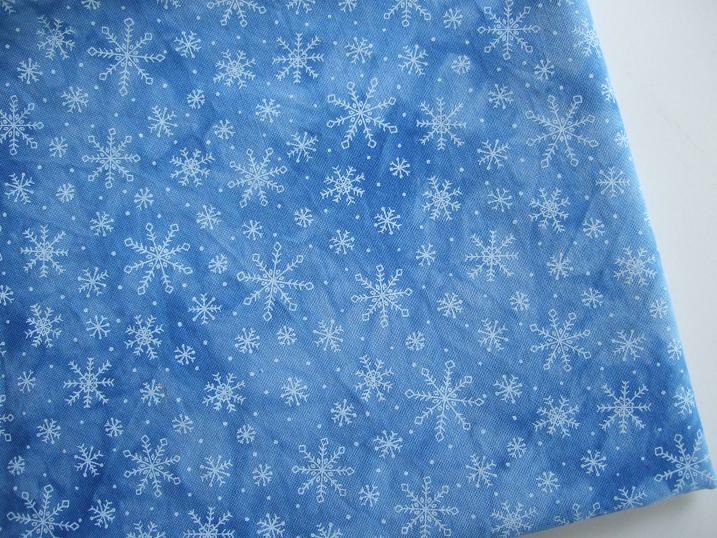 The result is this fabric. Procedure 2 I also want to show your how to dye a 1/2m piece of fabric that gives you more colour variation. I used the same two dyes but did not mix them together dry. Instead I put 3/4 tsp of Hot Pink in a measuring cup then added 1 cups of hot water, and then added 1 tsp salt and 1 tsp soda ash to the dye mixture. In a separate measuring cup I added 3/4 tsp of Cerulean Blue, 1 cup water, 1 tsp salt and 1 tsp Soda ash. I mixed until all the dyes and chemicals were dissolved. I then poured both dyes over the fabric at the same time. I waited an hour and then followed steps 8 to 10. The result was this fabric. 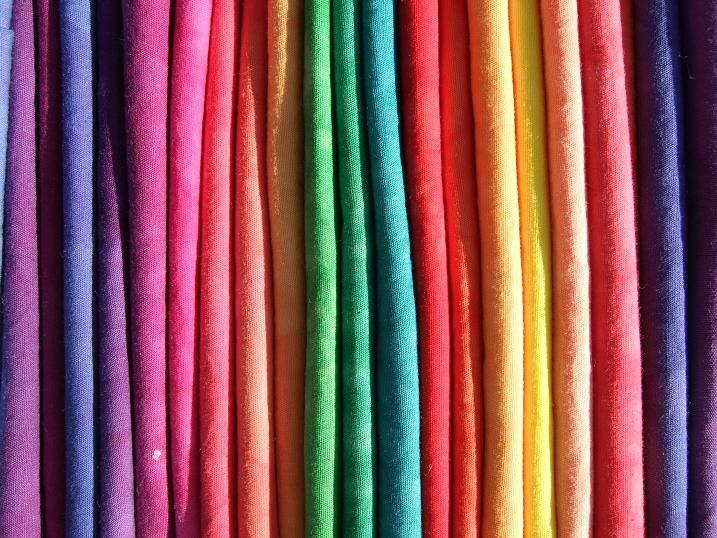 The addition of the soda ash in the dye mixture allowed the dye to set very quickly resulting in the the multi coloured fabric. So how your mix your chemicals will produce different results. I hope this helps those of you that asked how this was done. If you have any questions please don't hesitate to email me. There are so many ways to experiment with this process so if you give it a try please let me know how it goes for you, I would love to see pictures of your fabric!! Wow - they come out so pretty! There's a gal in my local guild who loves to dye her own fabrics. I just love seeing what people do. Boy, they sure do turn out beautiful!!! Wow, tutorial is great!! The fabrics are beautiful, looks like you are having fun with your time off!!! Have fun! I've been dyeing fabric before, but here I learnt a lot you do differently. I'll have to try it this way because I've always wondered how to get a mor clear "pattern" with the crumbled fabrics. I was taught to put the fabric into soda ash first and then add the colours. Thanks a lot for this tutorial! Really enjoyed you tutorial. The instructions were clear and the photos very helpful. I've been trying the low water immersion, but had soak the fabric in soda ash first. This procedure sound like more fun, thanks! Thanks so much for the detailed step-by-step and the ratios for the different additives. Just what I've been looking for. I find it interesting that some people use salt, some don't, some use urea, some don't. I think there will be a lot of playing around in my future. Can't wait to get started!